Starting on Monday, Feb 22nd DoTerra has a special treat for you that will be continuing all week long! BOGOs ARE BACK!!!!! 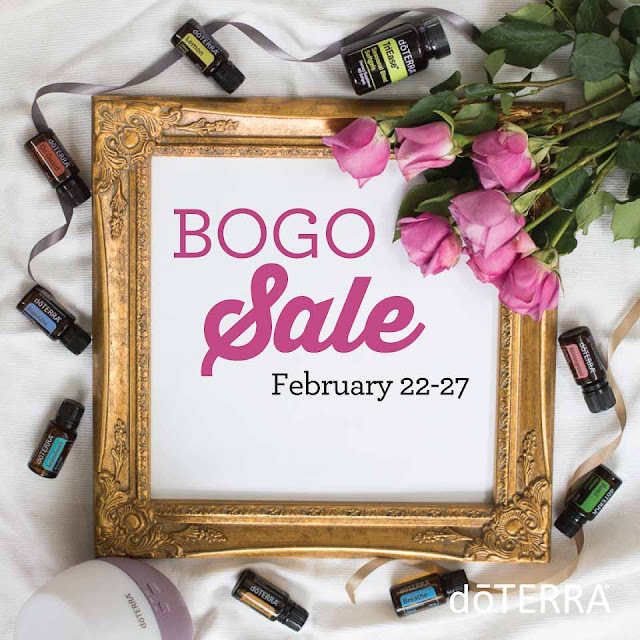 Join me Monday through Saturday for a unique BOGO each day, for a total of six specials for the week. BONUS: If you are currently member of the Living My Essential Life Facebook Page, and you take advantage each day the BOGO is offered, I will send you a FREE gift (something not part of the BOGO sales). Click HERE to find out how the BOGO works! Thursday only, buy one TriEase Softgels, get one Breathe bottle FREE! This may be the only case where buying in bulk is good for your health. Respiratory issues are prevalent in modern society, and essential oils are a perfect way to ease breathing consistently for a sustained benefit. 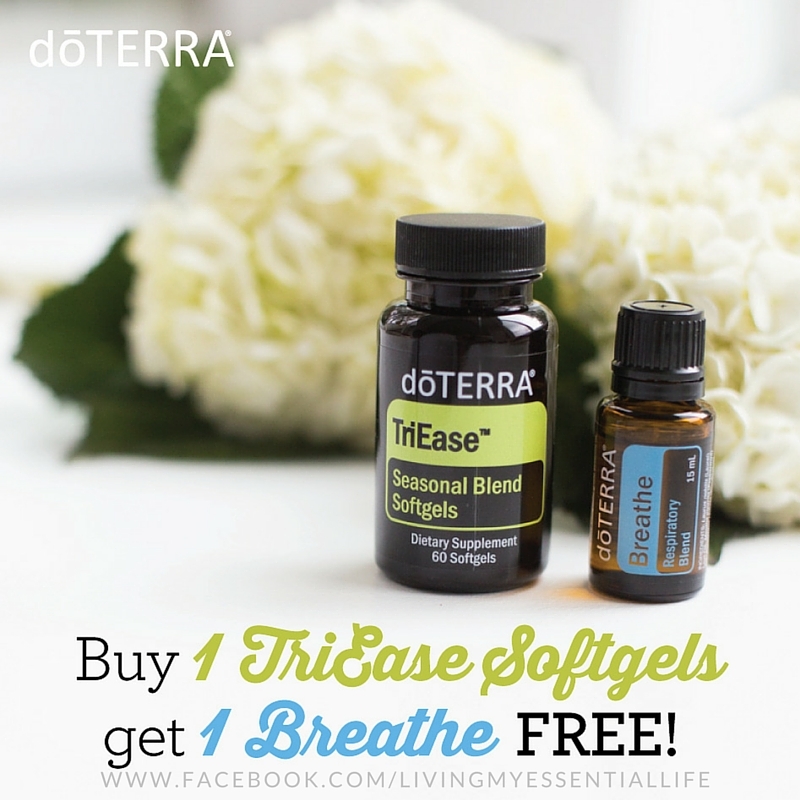 Breathe is a remarkable blend of essential oils which combine to do just that, help you breathe easier. A proprietary blend including laurel leaf, peppermint, eucalyptus, tea tree, lemon and ravensara cleanses and soothes the airways, and can easily be applied topically to the chest, back, or bottom of feet. Its pleasant aroma is calming to the senses and perfect for night time diffusion allowing for restful sleep. For aromatic or topical use. Slim & Sassy® presents a way to take better control of your hunger and help you on your path to managing your weight and ultimately your overall well-being. 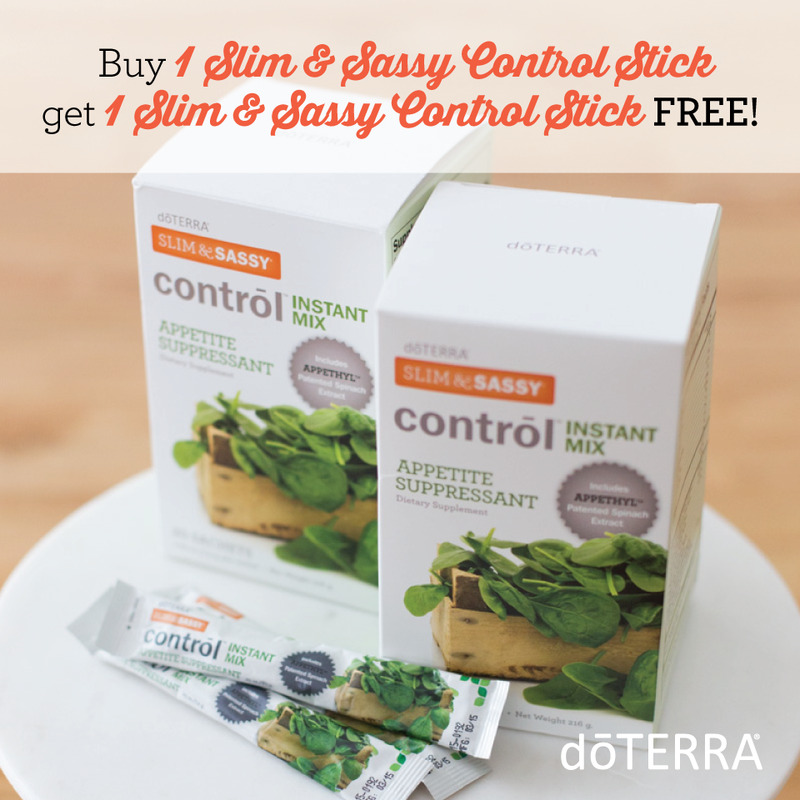 Slim and Sassy Contrōl is intended to be used during the course of the day to help control your appetite. It contains a revolutionary ingredient extracted from spinach that has been clinically shown to significantly reduce appetite for up to six hours. Contrōl is also available in a snack bar, (which comes in three different flavors) and also a drink mix format. 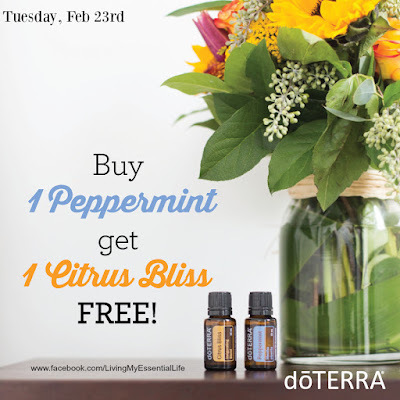 Tuesday only, buy a bottle of Peppermint get a bottle of Citrus Bliss free! 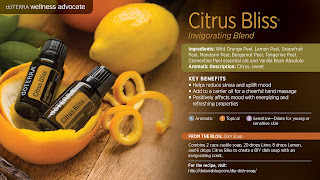 Energize yourself despite the gloomy weather with Peppermint essential oil and Citrus Bliss Invigorating Blend. Place your orders through me by 9PM Central. 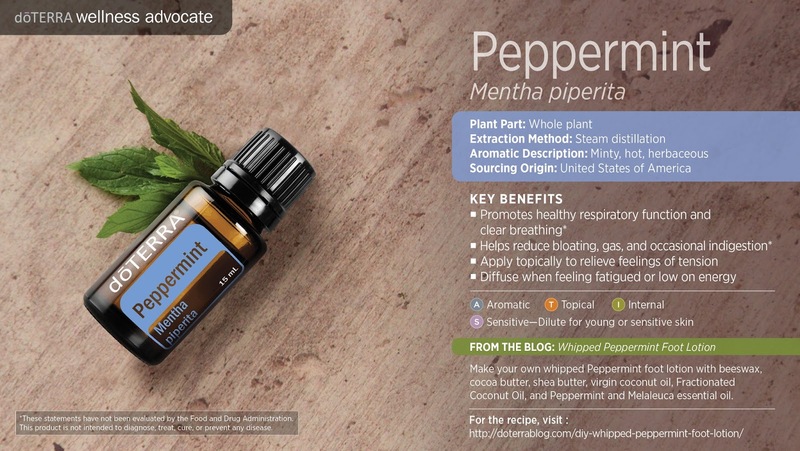 While the aroma of peppermint essential oil (Mentha piperita) may be synonymous in some minds with the candy, it's a lot more than flavoring. 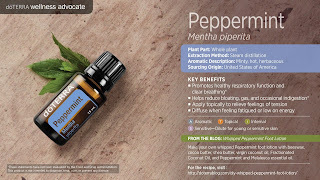 The essential oil of peppermint has been used for centuries for digestive problems, sinus and respiration and more. The oil is created by steam distilling the leaves, stems and flower buds, and the aroma of a quality brand can be very sweet, and obviously minty, in nature. It's most often used to support the digestive, nervous, and respiratory systems, as well as muscular and joint health. It's very cooling to the skin, which may be too tingling for sensitive skin or children. And whatever you do, don't get it near your eyes. Not fun. In addition to essential oil of Peppermint, also consider trying Spearmint, Wild Orange (for stress or uplifting), and Wintergreen. Rub on the stomach or take internally for occasional digestive discomfort. Add a drop of Peppermint to a homemade chocolate shake for a yummy twist. Skip the unhealthy snack, re-energize by applying Peppermint to the palms of hands and deeply inhaling. Use a drop or two on your temples to help enhance mental clarity. Invigorating Lip Balm: Heat 2 Tbsp of oil with 1 Tbsp beeswax until combined then stir in 10 drops Peppermint essential oil. Use once cool and firm. Soothing Skin Salve: Combine 2 cups oil with 1/4 cup beeswax, heat until combined. While still hot, stir in 20 drops Peppermint and 15 drops Lavender essential oils. Cooling Spray: Combine water and peppermint in a spray bottle, mist for cooling effect. 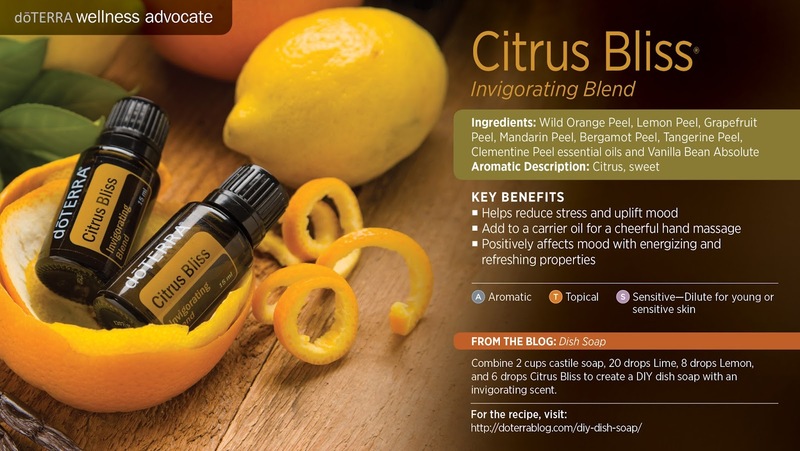 Citrus Bliss Invigorating Blend combines the powerful essences of Wild Orange, Lemon, Grapefruit, Mandarin, Bergamot, Tangerine, and Clementine with a hint of Vanilla to form this unique and harmonious blend. Diffused or worn topically, this invigorating blend will uplift and make anyone’s day a little brighter. Wild Orange, Lime, Cinnamon, and Clove Bud. Stress Reducer: Apply to back of neck. Put one drop in hands and rub them together. Put hands by nose and just inhale to help wake you up in the morning. Cleaning Spray: Put 15 drops in a 16-ounce bottle and spray to help cleanse counter tops. Bathroom Spray: 5-10 drops of this Citrus Bliss in a glass spray bottle along with 1 cup of raw apple cider vinegar provides an all natural counter and bathroom spray that smells like orange covered apples. Sugar Scrub: Make an invigorating sugar scrub with ¼ cup almond oil, zest of 2 oranges, 2 tablespoons of vegetable glycerin, 20 drops of Citrus Bliss essential oil! 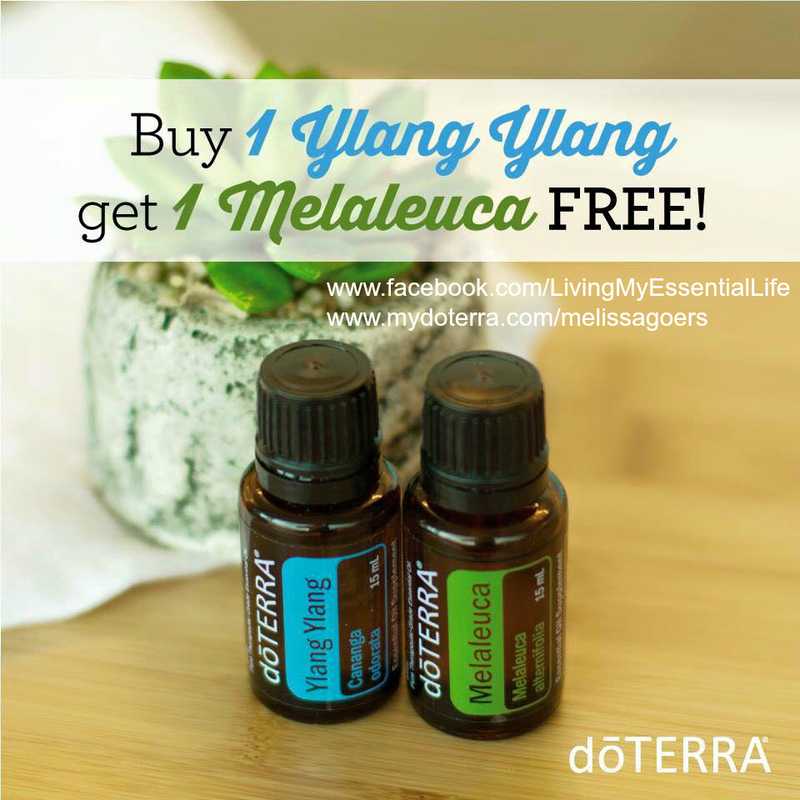 Monday only, buy a bottle of Ylang Ylang get a bottle of Melaleuca (Tea Tree) free! You and your skin should feel great about this. Place your orders through me by 9PM Central. 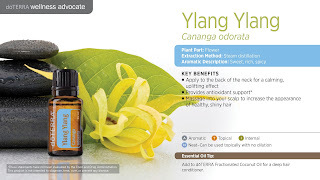 Ylang ylang essential oil (Cananga odorata) is one of my favorite oils. Although it's often only thought of as only a nice-smelling oil, the physical and emotional support ylang ylang can offer is much more than just a room deodorizer. It's smells overwhelming floral and sweet...in fact the descriptions I've read of the aroma include words like "intoxicating", "cloying", even "narcotic", which is interesting since historically it's said the original wild flower actually had no aroma at all. Ylang ylang oil is said to work with the cardiovascular, endocrine, and hormonal systems, as well as supporting emotional and spiritual balance. Many of these properties and the potential uses for ylang ylang are those that closely link the body to the emotions or the mind, showing very clearly the min-body connection and how Nature can help our body find balance as a whole. On a strictly emotional and spiritual level, ylang ylang essential oil is truly the oil of the heart (the best in my opinion). It can help us connect to our own heart, process things from the heart, and heal emotional traumas. It's also thought to be the oil of the inner child, helping us connect to our own sense of inner joy and being in the moment, as children so easily do. This allows us to play, release bottled up emotions, and move back into our sense of trust in the process of Life. Ylang Ylang blends well with Bergamot, Geranium, Grapefruit, Lemon, Marjoram, Sandalwood, and Vetiver essential oils. Depending on your uses for this oil, substitutes may include Lavender, Bergamot, Geranium, or Vetiver essential oils. Aphrodisiac Massage Oil: Mix 5 drops Ylang Ylang, 3 drops Sandalwood, and 3 drops Wild Orange in 1 tsp of carrier oil. Massage on inner thighs. Joyful Diffuser Blend: 2 drops Bergamot, 2 drops Grapefruit, and 1 drop Ylang Ylang. 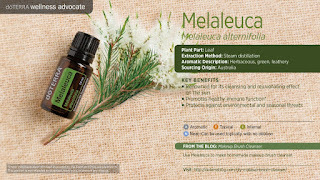 Melaleuca oil (Melaleuca alternifolia, or more commonly known as tea tree) has been used for centuries by cultures around the world to soothe. The oil is steam-distilled from the leaves of certain myrtle shrubs and trees, and said to be 12x the purifying strength of phenol. The aroma is pretty distinct, kinda like a cleaner, and herbaceous. It's not my favorite aroma, to be honest, but I suffer through it because it's a really great oil for immune support and cleaning. Of course, it can't do so without helping us to do our own inner work around the patterns we create, encourage, or accept in our relationships and why. In this way it helps us to love ourselves, trust our own abilities, enjoy our own presence, say no when we need to, and honor our needs for respect or love from the right people in our lives. Melaleuca essential oil blends well with all citrus oils, Cypress, Eucalyptus, Lavender, Rosemary, and Thyme. In addition to Melaleuca oil, also consider trying Lemon, Oregano, and Arborvitae. Add 1 drop to a veggie cap to enhance immunity. Combine 1–2 drops with your facial cleanser or moisturizer for added cleansing properties, or apply to skin after shaving to prevent razor burn. Apply to fingernails and toenails after showering to purify and strengthen nails. Add a few drops to a spray bottle with water and use on surfaces to protect against environmental concerns. Can be used to manage oily skin when applied directly or sprayed on with water. Natural Deodorant: Combine 1/4 cup of coconut oil, shea butter, and baking soda. Heat until combined. While hot mix in 20 drops Melaleuca and 15 drops Lavender. Shampoo for Oily Hair: Combine 1/4 cup of coconut oil and liquid castile soap and vegetable glycerin. Once combined stir in 10 drops Melaleuca essential oil. Foaming Face Wash: Combine the castile soap, Argan oil, and Melaleuca Essential Oil, then place in foamer bottle. To use, wet face and scrub with foaming face wash.